Arinos river, Mato Grosso state, Brazil. Photo credit: Michel de Andrade. 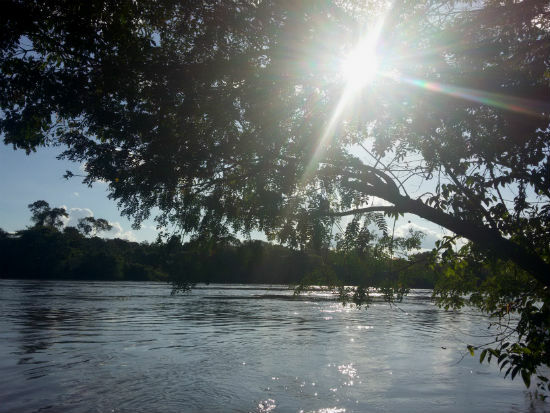 In this context, we conducted a financial and comprehensive cost-benefit analysis of this proposed dam, in partnership with Instituto Centro de Vida (ICV, Institute of Life Center), International Rivers, and Operação Amazônia Nativa (OPAN, Native Amazon Operation). The study was completed in tree stages. First, we evaluated the financial feasibility of the hydropower plant and its contribution to the Brazilian energy matrix. Next, we evaluated the economic impacts, considering three of the socio-environmental impacts resulting from construction of the dam: (i) greenhouse gas emissions of the dam; (ii) the opportunity cost of the flooded area; and (iii) the potential impact on fishing activities. Finally, we used the results obtained in the previous stages to conduct a cost-benefit analysis, in which total costs were subtracted from total benefits to calculate the net benefit of the project. The data used in this study were gathered from official reports, a field survey, and secondary data. Pedro Gasparinetti, CSF-Brasil’s Director, presenting the Castanheira study results. Photo credit: Alex Ferreira. Using traditional financial indicators, our best estimates are that the Castanheira Dam would generate a loss to the operator of approximately US$ 81 million. If we include the costs of net greenhouse gas emissions, economic losses from flooded productive areas and diminished fish stocks downstream, the potential loss generated by this project could increase to US$ 142 million. Thus, our results show that, if built and operating according to parameters given in official documents, the dam will not be financially feasible. We recommend that the government of Brazil should review the financial assumptions in the official documents, as well as the monetary quantification of the impacts associated with the proposed Castanheira Dam project. More broadly, the analysis carried out reinforces the need to quantify all potential impacts in addition to calculating financial feasibility. Most important, however, is the existence of an open and transparent discussion among different sectors of the economy, including policymakers and civil society organizations, on the potential benefits and adverse effects caused by dams. Such discussion should also consider the costs and benefits of alternative sources of energy so trade-offs can be accurately compared. Speakers at the meeting of the Environment Parliament Front. Photo credit: Alex Ferreira. Our results were presented in a meeting at the Brazilian congress, on February 28th, 2018, in Brasilia. Congressmen, local leadership, and representatives of socio-environmental NGOs - such as OPAN and The Nature Conservancy (TNC) - were present to discuss the possible construction of the Castanheira dam. These results will be presented in public hearings in the coming months, with the goal of influencing decision making towards more efficient and sustainable energy alternatives. Please, click here to download our full study (in Portuguese); here for our Policy Brief (in English); and here for more information about our project. To read the article (in Portuguese) written by Andreia Fanzere from OPAN, in which our results are mentioned, please click here.